Prelude ICE2002 (Iturralde Crater Expedition 2002) is the second expedition to the Iturralde structure (a suspected impact crater site) located in northeastern Bolivia. The goal of ICE2002 is to collect scientific evidence from the structure and its surroundings that will prove the existence of an impact crater to be identified as the Araona crater. The name Araona would honor the local indigenous people who have their villages and hunting camps within 20 kilometers of the structure. The first NASA trip (ICE1998) to the structure took place in October 1998 (ICE1998 flash site) and coincided with the beginning of the rainy season while this trip (ICE2002) took place in September to take advantage of the end of the dry season. Funding for the expeditions (ICE1998 and ICE2002) was obtained by Dr. Compton Tucker and Dr. Peter Wasilewski. For both expeditions Tim Killeen (TimK), working out of the Museo Noell Kempff in Santa Cruz, was responsible for the organizational details in Bolivia. The expeditions required his expertise with: the Spanish language, the various cultural nuances in the main cities, communication with the indigenous Araona, US Embassy contacts in La Paz, the acquisition of supplies and equipment that had to be obtained in Bolivia, and the employment and direction of rainforest guides, trailcutters and cooks. TimKs right hand man, Teddy Marcello Silas (Machi), would prove to be invaluable as a communications hub/organizer throughout the expedition from his base at Museo Noel Kempff Mercado in Santa Cruz. An advance party consisting of riverboat crew, trail cutters and logistic support out of Riberalta was coordinated by Chris Sellars (Chris), an expatriate Englishman enlisted by TimK. The riverboats (called peki peki because of the sound the motor makes) to be used on the journey up the Rio Manupari were captained by Luis Francis Riverero Aramayo (Pilo) and the trail cutting supervisor was an ornithologist named Oswaldo Maillard (Oswaldo). Aaron Rozenman (Aaron) a recent high school graduate would prove to be spectacular in his field support role. The advance NASA party, consisting of NASA scientist/education program leader Peter Wasilewski (PeterW) and Australian educator/soil specialist Peter Hardy (PeterH), arrived on September 4 at the Santa Cruz -Viru Viru airport where they connected with TimK to begin the pre-expedition planning and organization. Santa Cruz is a cosmopolitan city and economic center in southern Bolivia. Notable sites include the 24th of September square which serves as a gathering place for foreigners and natives alike in the center of the city. While in Santa Cruz the team witnessed a festival with colorfully dressed Clowns providing entertainment for children young and old. Kiosks lining the street were stocked with the crafts of Bolivian artisans. A large and prominent brick church located on the edge of the square has important historic interest dating to the 1600s when Santa Cruz was founded. 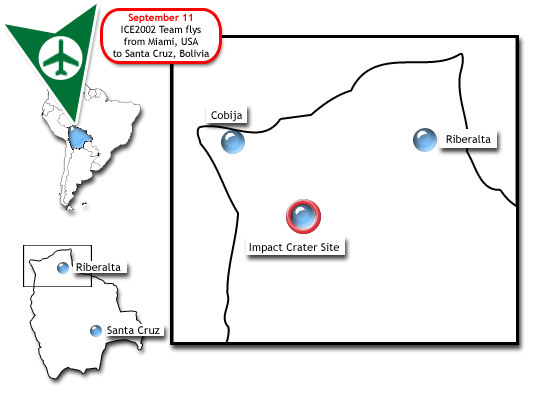 The ICE2002 NASA team was, by choice, airborne on September 11,2002 - a notable anniversary. Compton Tucker (Compton), Gunther Kletetschka (Gunther), Allen Lundsford (Allen), David Beverley (David) and Holly Offerman (Holly) arrived by commercial carrier from Miami, Florida into Santa Cruz to be met by Machi. While the NASA team was airborne Peter and PeterH traveled from Santa Cruz to Riberalta where they were met by Chris to make final preparations for the launch of the expedition. Rations of: Rice, beans, salty beef jerky, coffee, tea, sugar, salt, crackers, cookies, canned fruit, fish, lechee-powdered milk, and other foodstuffs were acquired. Basic utensils including: pots, pans, cups, knives and forks were also acquired to prepare the teams outback gourmet. Since the expedition timeframe coincided with the end of the Bolivian dry season we were not at all sure that water could be obtained inside the crater. In the best of circumstances the water would need to be treated with iodine or boiled to permit safe consumption due to a host of potentially harmful water bourne microorganisms. Previous experience in 1998 demonstrated that filters were useless with the muddy, sediment rich, river water. Knowing that the expedition had helicopter support the team purchased a large number of 5 and 10 gallon plastic jerry cans that would serve as super-sized canteens. Eyewitness Report: A team member's anecdotes about the day's events. Coming soon! Slideshow: A visual tour of the day's events. Coming soon! Video: Multimedia materials Coming soon! Science Data: Scientific input and discoveries from each day Coming soon!